The global manufacturing industry continues to grow at a swift pace, contributing about 16 percent of the global GDP and 14 percent of employment according to McKinsey Global Institute report. Clearly, this presents plethora of opportunities for marketers to promote and sell their offerings in both developed as well as developing nations where manufacturing remains an essential force. However, there exist huge challenges with respect to competition where marketers need to carve out their own special place. Having the understanding of all the nuances, Blue Mail Media can significantly help you shore up your marketing campaigns by providing you one of the most competent Manufacturing Industry Mailing List. Our Email list is designed to help you seamlessly connect with the target prospects and unlock new avenues of revenue. 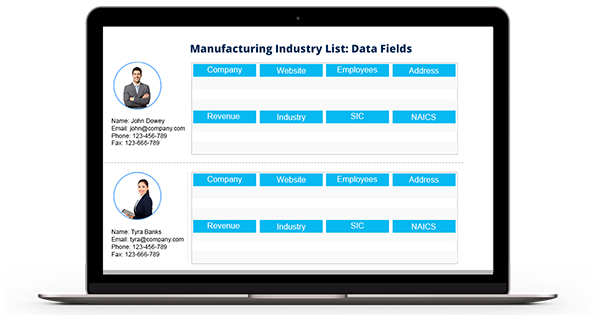 Our Manufacturing Industry Executives Mailing List has been created by immense hardships put into the collection of data from authentic sources, verifying information by making calls and sending emails, and updating the database constantly to maintain the accuracy of data. Also, we believe that each business has a unique set of challenges as well as opportunities, and thus, we offer pre-packaged Manufacturing Mailing List, as well as customized mailing list that aligns with your business specific goals. Blue Mail Media provides you complete marketing information to successfully execute your multi-channel marketing strategies whether you wish to reach your clients via telephone, email or mail. Also, there are no regional constraints as our strong data partner network enables us to serve clients across USA, UK, Canada, Europe, Asia, North America, Australia and other major markets in the world. Blue Mail Media also houses a competent team that ensures our clients are empowered with result-oriented manufacturing companies email list as we equate our clients’ growth to ours.